Bespoke audio furniture for visitor attractions, schools, museums, historic buildings, theatres, festivals and the home. I design pieces of audio furniture for public buildings and outdoor spaces. 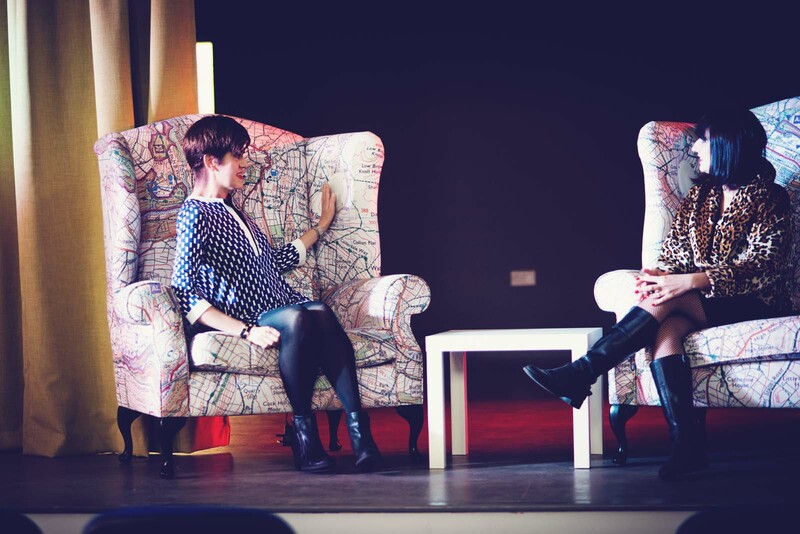 Talking Chairs were originally created for the Book Lounge at the Royal Festival Hall in 2001. 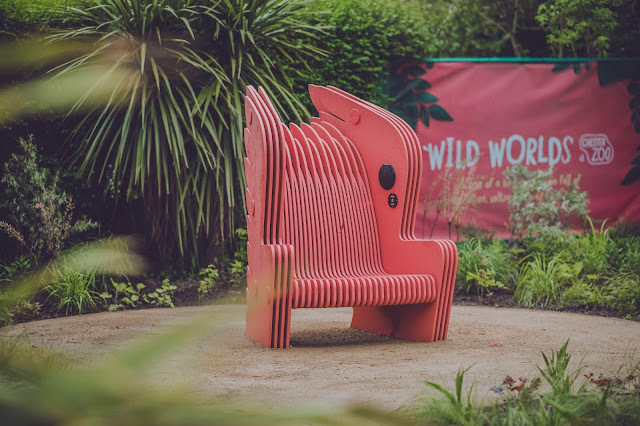 Three new Talking Chairs at were launched at Chester Zoo at Wild Worlds, a festival of art, gardens and science taking place throughout the sumer of 2018. The chairs chat to visitors about the zoo's animals and the plants grown for specially for them. Gardens were designed to surround each chair. They will remain at the zoo after the festival. The Ladybird Chair was made to mark 100 years of Ladybird Books. 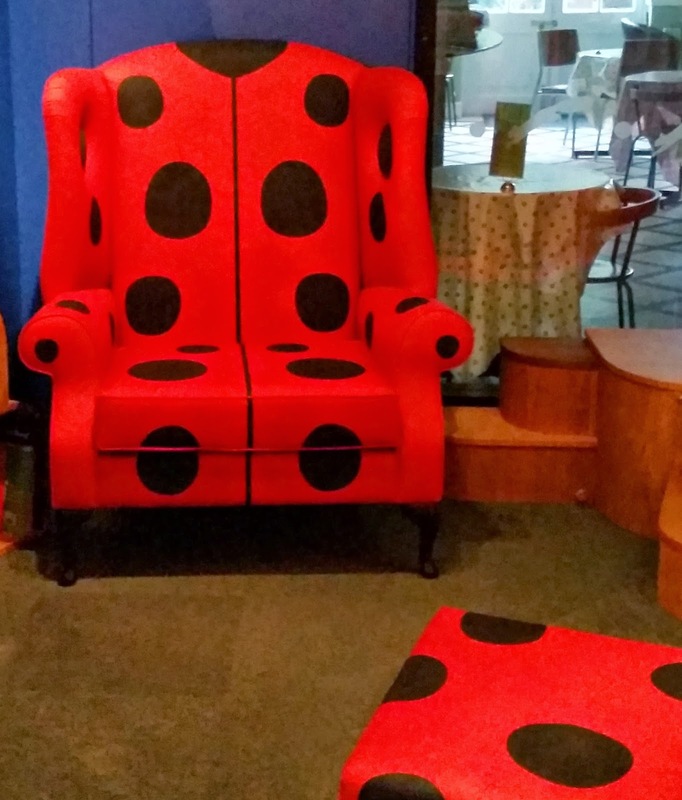 The chair and matching cushions are in a new gallery at Charnwood Museum in Loughborough, the town where Ladybird books began. The stories and poems recorded for the chair are spoken by Alex Mathie. "The chair looks fantastic. It looks fabulous in our space with the new furniture we’ve had made. The recording sounds brilliant and feedback from visitors is really positive. Thank you so much for our chair, we absolutely love it." The chair in Hebden Bridge Town Hall is a popular feature and is used by visitors every day. 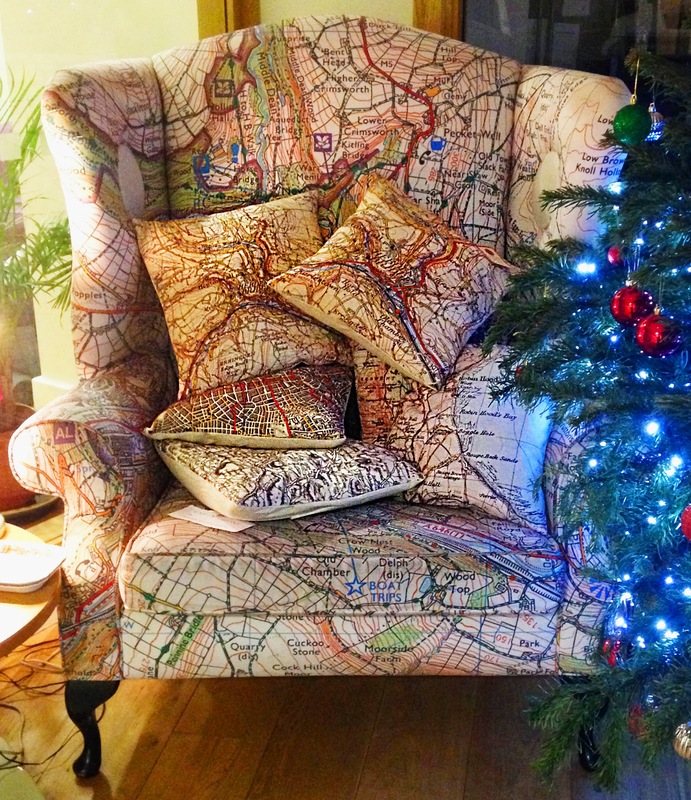 Here it's being used to display map cushions for a pop-up Christmas shop. This A-Z chair was auctioned to raise funds for Map Action - a charity which maps disaster zones to help relief efforts. It was donated by A-Z maps who owned it since 2002. This unique piece of furniture was created by artist Jane Revitt for The Poetry Lounge – part of the 2002 Poetry International Festival at The Royal Festival Hall. More than a chair covered in the A-Z map of London, it also includes loudspeakers in the wings, so you can listen to your favourite tunes. 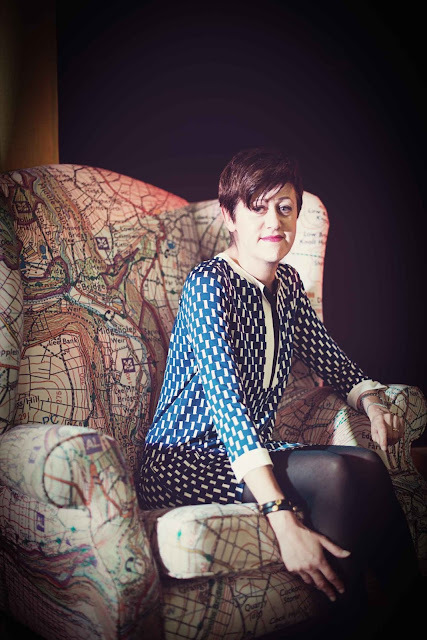 Salford Museum's chair was created for an exhibition celebrating 250 years of the nearby Bridgewater Canal. 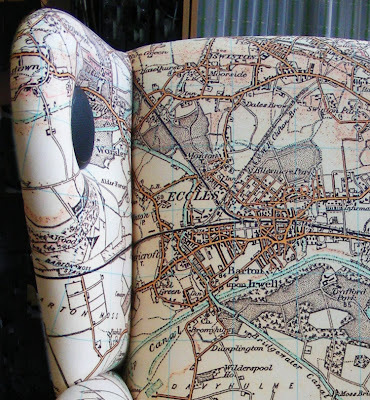 The chair was covered with fabric showing a map of the area in 1903. Voices of people recalling their memories and stories of the canal were played on the speakers. "Jane's Story Chair has been by far the most popular and talked about part of our exhibition. Not only does it provide a visual focal point in the gallery, it is inviting and encourages people to sit, listen and slow down"
The Salford chair is still as popular as ever, my colleague has organised for it to tour around libraries in Salford after the museum exhibition finished in January, and it has been so popular, people have been waiting at the libraries for it to arrive!"